You are currently browsing the tag archive for the ‘creeping red fescue’ tag. 7:45 Ssh. Don’t tell anyone. I’m watching golf on TV now. There was once a time when I shunned golf as a boring sport on TV. Whispering announcers, the sound of a woosh and 7 seconds of a picture of the sky do not compare with the action of the other major sports. In some respects, it still is a boring TV sport. But today is the US Open, one of the premier events of golf. A major championship match if you will. My daughters tell me it’s a sign of growing old to be watching TV golf. But it’s Father’s Day so they indulge me for a moment or two. By the end, they are watching too. This year’s event is played on a golf course called Chambers Bay. It is the first time the US Open is held in the State of Washington. Golf is normally a sport of snobbery in some respects, played on pristine courses with rolling green grass and impossibly manicured greens with rolling rivers or deep blue lakes and an occasional sand trap or weeping willow tree. Not Chambers Bay which was built on the site of a former sand and gravel quarry and has this weird type of grass called fescue. Apparently this sort of grass comes in varieties called, chewing, slender creeping, strong creeping, hard, sheep’s, blue, and strong creeping red fescue. All of it looked brown to me and none of the golfers could get a grip on it. This was fun golf. Their shots sometimes rolled uncontrollably and their normally perfect putts were unpredictable. Just like I golf. All that was missing was a windmill hole and a ramp or two. Here’s my running diary of the last few holes which were on primetime TV. 8:05 I have now heard “IT’S IN THE HOLE” bellowed for the thousandth time by what must be inebriated golf geeks when a golfer tees off. Dear Drunken Gold Geeks. We understand you saw Caddy Shack and it WAS a funny scene with Bill Murray, aka Carl Spackler, but you are repetitious and obnoxious, and neither witty nor funny at all. 8:20 A caddie actually asked someone in the gallery to put down their camera as his golfer prepares to putt. You won’t see that at a hockey game. 8:25 The announcer says, “He’s 92 feet 8 inches from the hole.” Are you sure it isn’t 92 feet 9 inches? It looks like another inch to me. 8:35 I have never seen a shot roll under a chain link fence and end up 10 feet from the railroad tracks except in miniature golf. 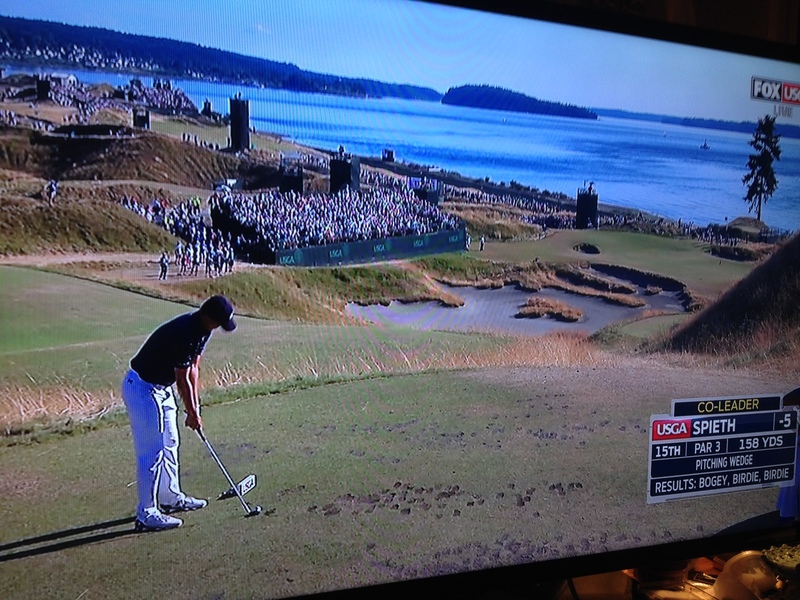 THAT’s why we love Chambers Bay. If only more courses were like this, maybe we’d all watch golf more often. 8:45 The 18th hole, final hole and it’s an incredibly close match. Justin Spieth takes just 4 strokes to go over a third of a mile (601 yards) to take the lead. Amazing what these pro golfers can do. 8:55 Then Dustin Johnson takes only 2 strokes to go almost the same length and finally lands 12 feet from the hole. If he putts it in, he wins it all. Even if he misses and gets close, he ties and forces a playoff for the title if he makes another short putt. It all seems automatic. 9:01 Johnson misses the first putt, but is just 5 feet from the hole, or is it five feet one inch? A tie and a playoff seems inevitable. We are all watching this big putt now in my house. Suddenly this boring TV sport is exciting. This is one of the things that is nice about the competition of golf. Instead of players trying to beat each other and trash talk and such, in golf, it’s the player against the course. Play your best game, shoot your best shot, there’s nobody trying to stick it in your face. So, Spieth sits silently in a sound booth watching Johnson, not guarding him, not trying to stop his shot, just watching and waiting. 9:03 Uh oh. Johnson misses them both. Spieth wins. You feel bad for Johnson but you’re happy for Spieth. At 21 years old, he becomes only the 6th player in history to win the Masters and the US Open in the same year. 9:17 Here’s the question she raised, “If it went to a playoff match on Monday, did you bring a fifth outfit.” Really, this is not a fabricated fact, she did ask the US Open Champion this after a truly exciting match. Yep, still another fine example of insightful sports reporting.